“If there is anything that I have learned in more than 22 years, it is that our greatest danger lies not in dreaming too large, but in dreaming too small. At UCF, we dream big. Our greatest limitations are those we place on ourselves,” said University of Central Florida President John Hitt this past December. 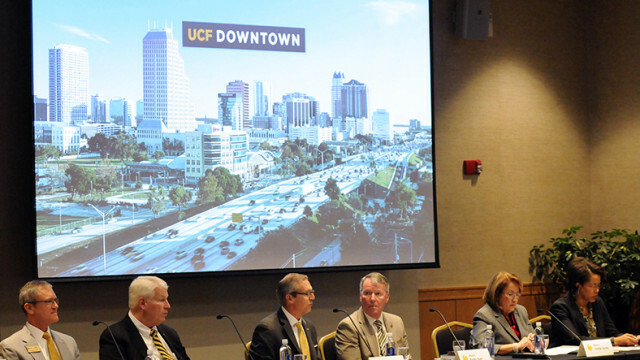 On Wednesday afternoon, March 2, his dream of a downtown Orlando campus was reinforced in a vote by the Board of Governors before a crowd of about 200 at Fairwinds Alumni Center at UCF. The next step to making his dream a reality is funding by the Legislature. The state’s largest school with an enrollment of 63,000, (second largest in the nation), will get a bit bigger with the anticipated 7,700 students expected to enroll at the proposed 15-acre campus at the intersection of Parramore Avenue and Livingston Street in fall 2018. The board’s vote paves the way for the Legislature’s approval of the state’s $20 million funding share during the current session, which will pay for one-third of the first academic building. Under the plan, UCF will pay $20 million and another $20 million will come from private funds. At the time of the voting, UCF had gained 80 percent of those private dollars through donations. 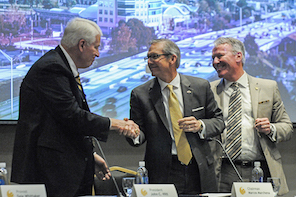 UCF President John Hitt, UCF Board of Trustees Chairman Marcos Marchena and Orlando Mayor Buddy Dyer congratulate each other for successfully taking the next step toward a downtown campus for UCF. 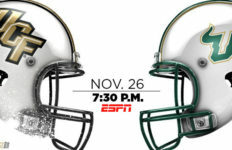 Photo Credit: Nick Russett/ UCF. Community leaders who spoke in support of the campus included: Orlando Mayor Buddy Dyer, Orange County Mayor Teresa Jacobs, Valencia College President Sandy Shugart, Orange County Schools Superintendent Barbara Jenkins and Orlando Magic CEO Alex Martins. The campus also will feature academic space for Valencia College’s culinary and hospitality students. Another benefit is that students will be able to take classes at Valencia College and UCF on the same campus. “Today, we can plant a seed in downtown Orlando that will benefit our students, community and state for decades to come,” said Hitt. The campus is expected to deliver a $205 million economic impact punch and create 2,000 new direct and indirect jobs. UCF Downtown will be built on a portion of the $1 billion Creative Village, a 68-acre parcel in the Parramore community that was cleared for redevelopment when Orlando’s old NBA arena was torn down. 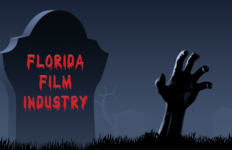 The new academic building will complement a renovated Center for Emerging Media building, where UCF’s nationally ranked graduate video gaming school, the Florida Interactive Entertainment Academy, is located. The campus will offer students an innovative learning environment within walking distance of a wide array of internship and job opportunities in fields such as digital media, communication, public service and health-related programs. The Orlando Magic, CFE Federal Credit Union and Florida Hospital each pledged $1.5 million. 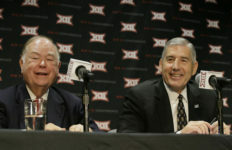 University leaders and board members have made personal contributions totaling more than $1 million. Orange County commissioners voted unanimously to contribute $3 million, and Valencia College will contribute $2 million. Other contributors to the campus include Creative Village Development, Orlando philanthropist Alan Ginsburg, Orlando City Soccer Club, CNL Financial Group, Universal Orlando Foundation and Universal Orlando Resort, Dr. Bruce Douglas of Winter Park, and Coca-Cola. Additionally, the value of in-kind contributions of land and infrastructure by the City of Orlando and the developers of Creative Village is approximately $75 million. The result: Count March 2, 2016, as a day (or Knight) to remember for UCF.